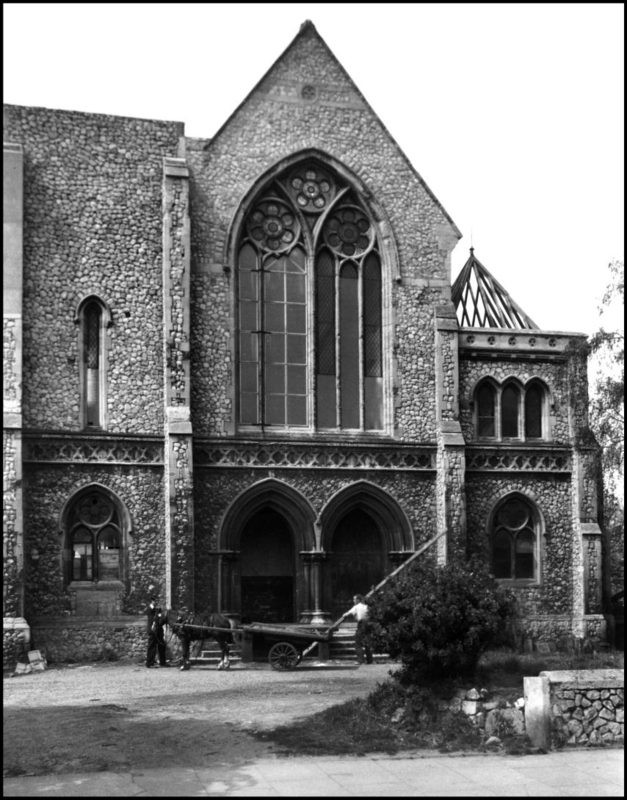 Immediately to the south of George Gilbert Scott's great Catholic Cathedral of St John the Baptist sits the most striking and memorable of all Norwich's post-war churches, Trinity United Reformed Church. 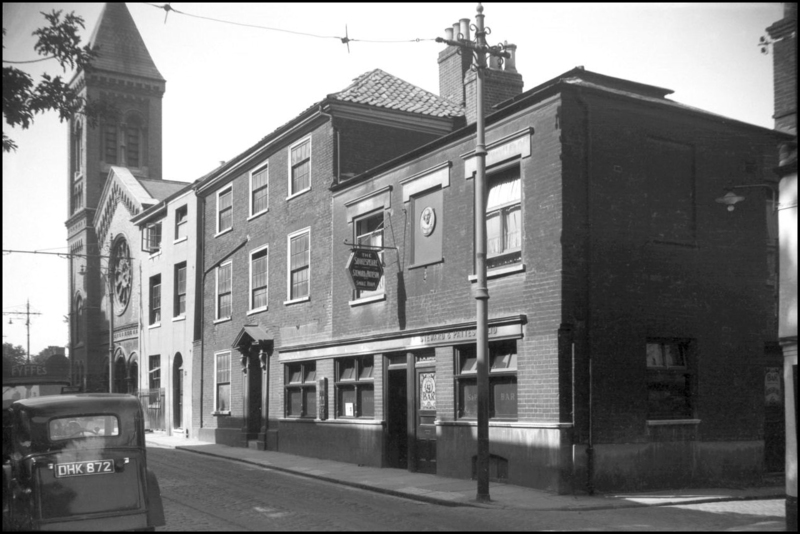 It was built by Bernard Feilden, and opened for business in 1956. It is on the former site of Unthank Road Baptist Church, which had been demolished for this purpose the previous year. 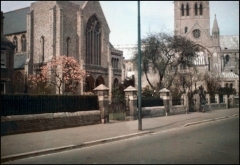 George Plunkett had taken an early colour photograph of it shortly before the outbreak of the Second World War, coming back in May 1954 to photograph it again as it was prepared for demolition. The light brick of the church, and the green lantern of the tower, are immediately reminscent of the 1938 City Hall further down the hill, both buildings being derived from Swedish influences, what is often refered to as the Stockholm Town Hall school. Trinity moves ideas on, the body of the church seeming to float above the lightly-enclosed plaza, as though it was sitting in water. There are echoes of this church in the more familiar work of Basil Spence in the following decade. There is a great harmony between the pointed angles of the church and the openness of the plaza; although curiously, as Pevsner observes, the square tower does not seem a participant. Of course, the United Reformed Church was still nearly twenty years away from existing when this splendid church was opened, and it began life as the Trinity Presbyterian Church. The congregation had been founded in 1867, a period of expansion for the denomination, and they built a fine church in the Byzantine style in Theatre Street in 1875. Like much of the St Stephen's area, it was completely destroyed during the Norwich Blitz of April 1942; George Plunkett took the photograph of it on the right in 1936. The old site was taken for street widening, and the Unthank Road site nearby, although slightly further out of town, was used for the replacement. In 1972, the Presbyterian church combined with large parts of the Congregational movement to create the United Reformed Church, which took its place as one of the three main non-conformist denominations in England. 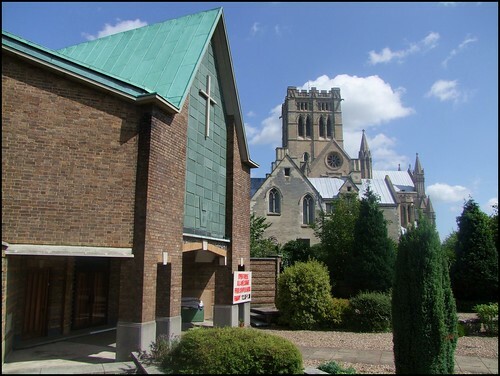 As with the Methodists and the Baptists, this process of consolidation has led to the loss of a number of older chapels, but Trinity survives as one of the flagships of the URC in Norwich today.